dt call Archives - Pebbles, Inc. 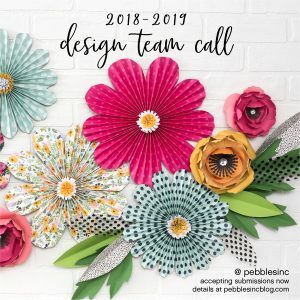 The Pebbles Inc. Design team call for 2019 is now open! Hello friends! Can you believe it’s been a year since we were updating our team? It has! And it’s time to do it again! We are currently accepting applications for paper crafters to join our team. What does it mean to a part of the Pebbles Inc. team exactly? Well… a few things. First, you will need to post at least twice a month on the Pebbles Inc blog (with coordinating posts on at least one of your social media channels – hopefully 2!). Posting includes writing up the blog post, taking great photos and adding them to our WordPress blog. We often repost some of these photos to our Instagram and Facebook accounts (when you post, we’ll have you send us a few of your favorite photos). Second, you’ll be a brand advocate for Pebbles Inc! If you see friends online that have questions about any of the products, we’d love to have you share your passion for Pebbles Inc. with them! As you complete the above, you’ll be compensated monthly with product as well as monetary compensation (product is sent out as we have new releases, the monetary compensation is sent out monthly). You will also get the chance to participate in a few projects with our sister brands (if you are available) – but the bulk of your time will be focused on sharing projects with the Pebbles brand. An introduction to you! Tell us how you’d define your style, what you love making most, where your passion for creating comes from…totally up to you on what to share! All your social media handles so we can get to know you a little more there! Due date for applications is November 27th. They need to be emailed to pbsocial@americancrafts.com. We’ll pick the team during the first part of December and notify everyone by email of the results. Thanks in advance for your love of our brand and the products we create – we love seeing what YOU create with them!